Head on an incredible Camino de Santiago adventure this Autumn with CaminoWays.com, the walking holiday specialists. With mild temperatures ideal for walking, October is one of the very best months of the year to experience the Camino. Most Camino routes are also less crowded meaning walkers can enjoy the sights in a much more relaxed setting. To help you chose which amazing Camino to walk this October, CaminoWays.com have selected their best Autumn routes – each offering stunning scenery, rich culture and delicious food options! This 100km-long trek is the classic week-long Camino de Santiago trip and begins in Sarria, on the French Way. The town of Sarria is one of the most popular starting points of the Camino de Santiago, as it allows pilgrims to receive the coveted ‘Compostela’ pilgrim certificate once they reach Santiago de Compostela. This 7-day route is perfect for Camino beginners. 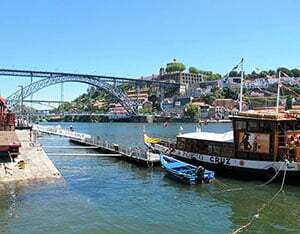 This is another fantastic Autumn Camino which starts in the UNESCO-listed city of Porto. Here, walkers will find beautiful tiled buildings, picturesque Port wine cellars and a lively riverfront by the Douro River. From Porto, the Portuguese Way takes you across rolling hills, forests and quaint villages and finally finishes in beautiful Galicia. Lugo is one of the best places on the Camino to visit in October as it celebrates its San Froilán festival between the 4th-12th of October. The festival is one of the most loved in all of Galicia and visitors can expect to see parades, brass bands, food markets and street performers. From Lugo, this path follows the fascinating Camino Primitivo, the oldest Camino route. Journey along the Via Francigena, Italy’s Camino route, and discover the beautiful landscape and delicious cuisine of Tuscany. Autumn is the ideal time to experience all that this region has to offer with various gastronomic festivals taking place, such as the famous white truffle festival in San Miniato. The last section of the Via Francigena from Viterbo is another fantastic Camino walking route for Autumn. Make your way through the pretty medieval town of Viterbo and across the Lazio countryside, taking in the incredible colours of this beautiful region before finishing up your journey in historic Rome, home to some of the world’s most impressive ancient sights. Includes: Half-board accommodation, luggage transfers from hotel to hotel, holiday pack with walking notes and practical information. Does not include: Flights, insurance, airport transfers (optional). Contact our travel specialists for hotel upgrades and our ‘Superior Collection’.